It has been quite a while since man learned how to subdue nature and centuries since he made it bend to his rule. However, entire millennia will pass before he is able to successfully control the spread of one of nature’s most persistent, albeit troublesome, but highly intelligent species of rodents, namely, the squirrel. The sheer fact that there are well over 250 species of squirrels around the world is remarkable as it speaks about the intelligent nature and cunning of these animals. These traits are especially expressed when squirrels come into contact with humans, and although they are an entertaining sight to see, they can still pose a problem when they inhabit one’s attic or any other object that is intended for use by humans. 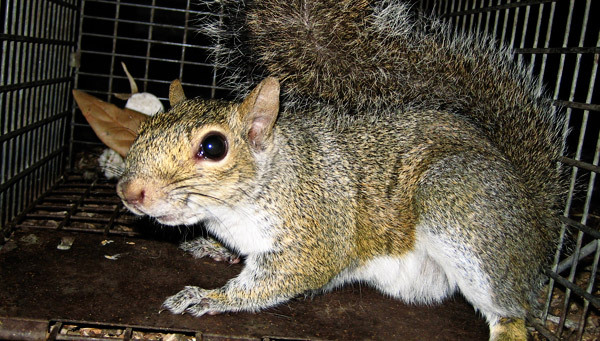 Whether the main worry is the material damage they can do by chewing on various wires throughout the house, furniture, doors, or anything else not made of metal, or the potential health risks that they pose to humans by carrying ticks and flees which could be infected with various diseases, one’s safest bet would be to proceed with immediate catching and removal of the squirrels from the premises. To build it, you will need: 50-80 cm of steel wire that can be twisted to make a snare, a longer piece of wood on which you will mount the snare and some food as bait, this can be anything from peanut butter, sunflower seeds or nuts. Cut the steel wire so that you can make at least two snares and mount them on the opposite sides of the wooden pole by twisting the wire around it and placing them some distance from the middle of the pole. Thereby, you are forcing the squirrel to pass through them in order to get to the bait placed in the middle. The idea is that the snares are of a sufficient diameter to allow for the squirrel’s head to pass through, but not the rest of the body, so it would become trapped in its attempt to get the food. Therefore, the greater number of snares you have on the pole, the more squirrels you can trap. In conclusion, this is an extremely useful method of catching squirrels if you are looking for a solution that simply works, or it might be the case that many squirrels are just too curious for their own good. Go back to the How to get rid of squirrels home page.